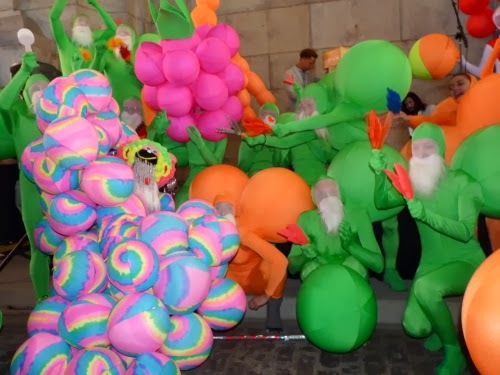 Led by the Russian performance artist Andrey Bartenev, scores of zanies dressed in colorful bubble costumes marauded through the DUMBO Arts Festival on Saturday. Above, the bubblefolk surround another exhibition, Sublime Virtue by Monica Jahan Bose. 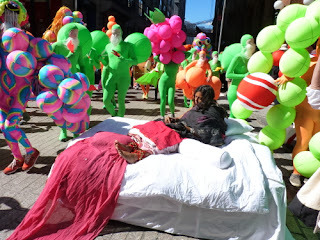 Sitting soundlessly on a bed in the middle of an intersection, she ignored them. The Bubbles danced around during a poetry reading under the Manhattan Bridge Archway (above), along the Pearl Street Triangle to Jane’s Carousel, and finally to the Tobacco Warehouse for a giant bubble party. Here they are on the Empire State Park law, running around on the Brooklyn Lawn Quilt project (by Fort Makers). In the background on the water, you can see the "Ship of Tolerance," by Ilya and Emilia Kabakov and children. The 2013 DUMBO Arts Festival continues on Sunday from noon to 6 p.m. Highly recommended!